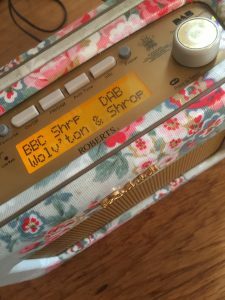 A few years before my decluttering journey started, leading up to my birthday, I printed off a few pictures of a Cath Kidston radio with hints scattered around the house that I really really wanted it. Well my birthday in the July came and went and no radio was received but the little pictures stayed around the house..Sadly in the October my lovely mum lost her battle with cancer & passed away in our local hospice, and I thought sod it…life is too short and out came the laptop, my bank card and I was just about to pay the £200 for the beautiful radio I had wanted when my husband tried to stop me ….It turned out my mum had said to my husband before she died to get me the radio, it was actually on its way in the post. waiting for my friend Lyn who is the collage artist I mentioned 2 weeks ago in my blog post Art Lunch & Wet in Shrewsbury to be interviewed by local DJ Jim Hawkins. 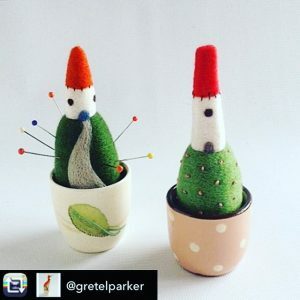 While whizzing through the pillow cases I listened to a lady talk about her Needle Felt workshops and as her interview came to an end she mentioned she was looking to do some local workshops in Shrewsbury but as yet hadn’t found a suitable venue. 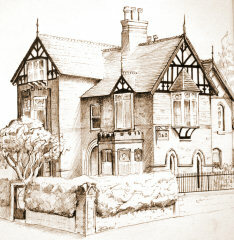 (Over the years here at Ferndell B&B Ive held many creative workshops, my kitchen is an ideal space, large enough for me to be busying about in the background with tea/coffee lunch prep etc but still lots of space for the creative stuff to take place).. well my ears pricked up and quick as a flash I tweeted the DJ @jimallthetime to say please pass on my details..(I love social media for that sort of thing) well the very next day my new friend Gretel was having Tea and cake with me and we agreed upon the first Thursday in March 2017 to hold her needle felting workshop here Under the Kitchen Chandeliers. Funny how things turn out, had I not have been waiting to hear Lyn I would never have met Gretel as I would have been listening to Radio 1 or watching Homes under the Hammer..arh one of the programmes my mum used to watch while ironing the sheets for me.